To be honest, I'm not a fan of hair down there. I love cleanness and smooth skin. Especially, if you like to go swimming or sunbathing, you don't want any hair waving down there, right? *o* So, now I'm going to share with you some bikini tips with sugaring. I usually use Sugar Pot Wax every month to wax, and I know some people prefer to do laser hair removal, but if you want to do a more natural way and not so pricey, here is my bikini wax tips for you, guys. Please don't ever shave your hair, it's a HUGE mistake. You don't want your hair looks like man's beard when it grows, right? Before wax, make sure the area that you want to wax is clean. After wax, it suggested to take a shower, so the wax residu will get washed away and clean perfectly. After wax, there might be redness on your skin, it's better to apply soothing mist or baby oil to calm and cool your skin. There might be some hair left behind, so you need to remove them using tweezers. Don't forget to scrub few times a week to prevent your skin from ingrown hair. I always prefer sugaring, because it's not hurt like usual waxing. The method is basically the same, it's just different in ingredient. 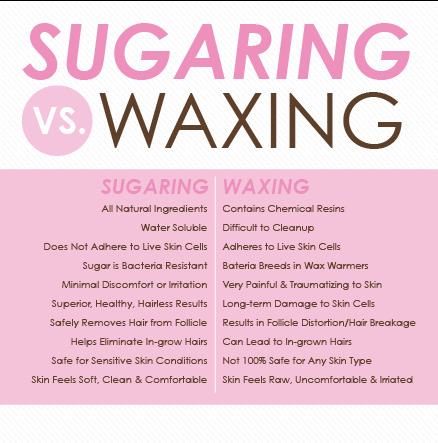 Here's some reference about the difference between Sugaring and Waxing. Well, I hope you will find this quick tips is helpful, and if you have any thoughts, let me know by leaving comment here.